Could you use an extra credit line? We can help with that. 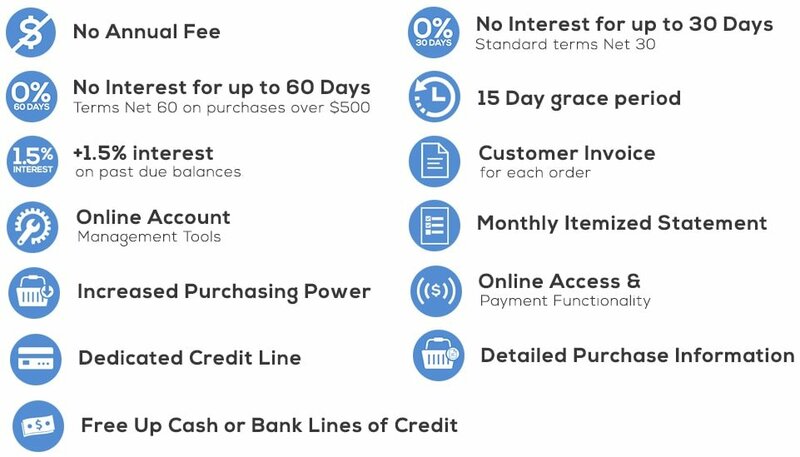 NO INTEREST for up to 60 Days*- Terms Net 60* on purchases over $500. +1.5% interest on past due balances. Customer Invoice for each order. What is the Billing / Payment Cycle and how does this work? You will receive a separate invoice for each order shipped, plus receive a monthly summary statement. Invoices are generated for each transaction and generally delivered to the customer with 48 hours. Payment is due in full 30 days from the date of transaction. No Interest will be charged to purchases if paid in full within 30 days from purchase or 60 days for orders of $500 or more. No interest will be assessed if you pay the amount due for each qualifying purchase within the term extended from the purchase date. If you do not, interest will be assessed on the full amount of the purchase from the purchase date, and on a continuing basis until the debt is paid. No minimum monthly payment will be required. Payments received will automatically be applied in the order of purchases made. Standard 30-day account terms apply to non-promotional purchases. Who is BlueTarp Financial and how does this work? BlueTarp Financial, Inc. is a business to business credit management company with programs designed specifically for the building materials industry. The program offers trade customers a combination of commercial trade terms, extended financing, and easy-to-use online purchase and payment records. Download a printable application. Complete, fax to CabinetParts Business Credit Applications Fax number (855) 822-0448 . Once we have received your application, it will be reviewed for completeness and forwarded to our program partner BlueTarp Financial for credit qualification and approval. During this process, you may be contacted by a representative of CabinetParts or BlueTarp Financial for additional information. The review and approval process is often completed within 24 hours but may take longer. Once credit determination is made by BlueTarp you will be notified along with an initial amount of credit extended. Please note: This jointly developed credit program is offered as a service to trade customers of CabinetParts.com with established businesses. Decisions regarding credit acceptance along with the amount of credit extended are made by program partner BlueTarp Financial at their sole discretion. What about placing orders using the Credit Program? Once you're credit application have been processed by BlueTarp Financial you will receive a determination notice by email confirming account activation along with the amount of credit initially authorized and extended to your account. Once you’ve received this notice your account will be activated and you may begin placing orders and charging to your account up to your account limit. If you wish to have an order shipped prior to establishing a trade account you can simply use one of our other payment options.